There are many trails throughout Lake County with a majority of them being in the Fremont National Forest. The trails offer a close encounter with many environments throughout the country from high mountain forests, to wetlands and meadows, to deserts. There are several excellent and breathtaking viewpoints for those desiring a truly scenic view of the surrounding areas, including the cascade range (even Mt. Shasta), the valleys, Hart Mountain, Abert Rim, and the surrounding mountains and desert areas. The activities are just as varied, from fishing, wildlife viewing, wildflowers, birdwatching, or photography, there is a trail for anyone. The Campbell and Dead Horse Lakes Trail System is open to equestrians, mountain bikers, and hikers. The trails average between easy to moderate with one section ranked as difficult. There are plenty of recreational opportunities in this area ranging from fishing and hiking to wildlife and birdwatching. Campgrounds are located at Lee Thomas Meadow, Campbell Lake, and Dead Horse Lake. The trails in this system are: Dead Cow Trail, Dead Horse Rim Trail, Lakes Loop Trail and the Cache Cabin Trail. Check with District Office for fire restrictions. The Gearhart Mountain Wilderness Area lies about 30 miles to the west of Lakeview and is closed to all motorized and mechanized vehicles. The trails are open to hikers and equestrians. At this time there are two entry points entry into the Gearhart Wilderness area, one from the north at the and one to the south. This wilderness area offers a look at some interesting geological areas, an opportunity to hike through varied environments, a chance to see some wildlife, birds, and wildflowers, and an opportunity to do a little fishing. Because of the altitude it is necessary to go prepared for any weather situation as it can change in a matter of seconds at any time throughout the year. The party size is limited to 10 heartbeats, including humans and animals. The Cottonwood Meadows Recreation Area Trail System is located high in the mountains to the west of Lakeview. Besides hiking there is also opportunity for fishing, bird and wildlife viewing, and wildflowers. The trails at Cottonwood Meadows are open to horseback riders, hikers, and mountain bike riders. The Fremont National Recreation Trail is currently under construction with only a few places left to be completed. The completed project will travel the length of the Fremont National Forest from north to south and will eventually link the Pacific Crest Trail to the Desert Scenic Trail. As of March 2000 two 15 mile segments of trail are unfinished. There are two trail systems discussed here: #160 from Government Harvey Pass to Cox Pass and the #160 Northern Segment. The trails are open to hikers, mountain bikers, and equestrians but are closed to motorized vehicles. Sites along the trail are available for primitive camping. The trail is accessed via many adjoining trailheads and/or trail systems. Before setting out check with the Ranger District Offices for fire restrictions. Warner Mountains Trail System covers the Warner Mountains to the east of Lakeview. It ranges from Vee Lake in the north south into Northern California and the Crane-Bidwell Semi-Primitive Motorized Area. There are aproximately eight access points along the trail. The northern segment of the trail is the Fremont National Recreation Trail #160. This changes to the Crane Mountain National Recreation Trail #161 at the South Fork Crooked Creek Trailhead. Mill Trailhead accesses trail #150 which joins the Warner Mountain Trail System at the South Form Crooked Creek Trailhead. This trail system passes through a variety of high forests and meadows. Antler Trailhead is located at the eastern border of the Yamsay Mountain Semi-Primitive, Non-Motorized Recreation Area. It currently travels a total of 54 miles south to the Paisley Ranger District boundary, about 3 1/2 miles south of Fremont Point. At the trailhead there are 5 campsites with tables and fire grills, accessible outhouses, and drinking water is available June through October. Firewood may be gathered from nearby, but not from the campsites. There are horse corrals and hitching rails. Hikers, equestrians, and mountain bikers are welcome on the trail but please remember that the trail is non-motorized. The recommended season is May through November and please check with the district ranger offices for fire restrictions. Restrictions: Check with District Office for fire restrictions. Blue Buck Trail #171 travels from Blue Buck Springs to Rodman Rock across the Yamsay Mountain Semi-primitive Recreation area and intersects with #160. This 8.5 mile trail is ranked easy to moderate with a low elevation of 6,800 feet and a high of 7,400. It travels through thick stands of lodgepole pine, Shasta Red Fir, and offers views of the Gearhart Mountain area, Buck Ridge, the Fort Rock basin and the Cascade Range. The Farm Well Trailhead grants access to the Fremont National Recreation Trail. Its five mile trail leads hikers, horseback riders, and mountain bikers to the top of Hager Mountain. The accommodations are rustic campsites with an accessible outhouse and drinking water. Visitors can gather firewood off the site and are asked to limit their stay to 14 days. The trails are non-motorized. The recommended season is May through November. Check with the Ranger District Office for fire restrictions. The Fremont National Recreation Trail #160 Northern Segment is also known as the Southern Oregon Intertie Trail. At its north western edge the trail crosses Yamsay Mountain. At 8,196 feet above sea level, the views of the surrounding area are breathtaking. The Fort Rock basin lays open to the north east. Mt. Shasta and the snow capped Cascade Range fill the western view. The trail passes through Antler Trailhead and Silver Creek marsh on its way to the next eastward summit. Hager Mountain offers breathtaking and contrasting views of the Great Basin with the gray-brown desert, stark rock formations, and the green valleys and trees playing for control of the land below. At Farmwell Trailhead, the path turns southward and climbs to the top of Winter Rim. Of the 30 proposed miles for the trail, 14 have been completed as of March 2000. The view of the Summer Lake basin from the top of Winter Rim is breathtaking. Trailhead facilities are spaced about 5 to 10 miles along the trail and the trail is well marked. Every two or three miles are pack stock watering places and primitive but suitable campsites can be found along the trail. For those who do not wish to traverse the entire trail there are various road access points. The Fremont National Recreation Trail #160 Government Harvey Pass to Cox Pass Trailhead is a wonderland of ecosystems. Almost every type of environment the Fremont National Forest has to offer can be viewed along this 50 mile route. It follows the crest of Winter Rim, which also offers some spectacular views of the Summer Lake Basin and the eastern High Desert. The trail also offers access to the Slide Mountain Geologic Area via a short detour. Fishing opportunities are available as the trail travels along Bear Creek and the Chewaucan River. After crossing the Chewaucan River, the trail climbs to Morgan Butte where a fire detection station is staffed by the Forest Service. After Morgan Butte it is 8 miles to the Moss Pass Trailhead and then 15 miles from Moss Pass to Cox Pass Trailhead. The trails are well marked at junctions as well as with reassurance markers in gray diamonds and blue, white, and red NRT logo markers. Cox Pass Trailhead grants hikers, horseback riders, and mountain bikers access to the Fremont National Recreation Trail. Although the trail is still under construction, hiker can traverse 50 miles from Cox Pass to Government Harvey Pass from this access point. There is a parking area with adequate turn around for a trailer and a toilet. The trail is marked with signs. The trail and parking area is maintained from June through October 15. The Moss Pass Trailhead is open to horseback riders, mountain bike riders, and hikers. From Moss Pass it is 35 miles North to Government Harvey Pass or 15 miles south to Cox Pass. There are four parking spaces at the trailhead and an "eye of the needle" drive-through turn around. The outhouse is accessible and there is water for pack stock. The trail is signed. The area is maintained from June to October. The Crane Mountain Trailhead is an access point for the Crane Mountain National Recreation Trail and the Crane-Bidwell Semi-Primitive Motorized Area. The area south of Crane Mountain Peak is open to motor cycles, off highway vehicles, 4x4 vehicles and snowmobiles. The trails to the north of Crane Mountain Peak is closed to motorized vehicles. There is parking at the trailhead with trailer turn around area and signed trail directions. The trail itself is accessed about 3 miles west of the trailhead marker from Forest Road 4011. Crane Mountain can boast of being the highest point in Lake County at 8,456 feet above sea level and offers a stunning view. Mill Trailhead is located a short distance north of Lakeview several miles to the east of highway 395. It accesses the Fremont National Recreation trail. There is a parking area with room for a trailer turnaround. The restroom facilities are 1/2 of a mile before the trailhead and there are signed trail directions. The trail is non-motorized. The recommended season is from June through October. Activities around the trail are wading, fishing, wildflowers, wildlife viewing and birdwatching. East of Lakeview are the Warner Mountains and Crane Mountain. Rogger Meadow Trailhead is located almost due east of Lakeview and accesses the Crane Mountain National Recreation Trail. This trail is open to hikers, equestrians, and mountain bike riders. The trailhead is at 6,300 feet above sea level and there is paved access to the trailhead. At the trailhead there is a parking area with room for a trailer turnaround and an outhouse. At 6,200 feet above sea level, Bear Creek Trailhead is an access point for the Fremont National Recreation Trail running along Winter Rim, Slide Mountain Geologic Area, and Bear Creek to the north and Little Bear Creek, Bear Creek Canyon, and the Chewaucan River to the south. There are signed trail directions. Parking at the trailhead is limited. This is a non-motorized trail open to equestrians, mountain bikers and hikers. Activities around the trail include birdwatching, fishing, wading, wildflowers, wildlife viewing, and photography. Lakes Loop Trail #140 is 9 miles in length and runs a series of loops between Campbell and Dead Horse Lakes. It is joined at the east and west ends as well as the middle. This offers an optional 5 or 9 mile hike. This trail also connects to Dead Cow Trail #141, Dead Horse Rim Trail #139, and the Cache Cabin Trail #148. These trails combined present about 24 miles of hiking possibilities. The trails are well marked at junctions as well as vertically aligned rectangular blazes as reassurance markers. The scenic outlooks, especially from Campbell and Dead Horse Rims are spectacular. The elevation ranges from a low of 7,720 feet to a high of 8020 feet and is ranked as easy to moderate. Dead Cow Trail #141 is about 3 miles in length and ranges from 6,710 feet to 7,400 feet above sea level. It is ranked from easy to moderate in difficulty. It runs from the northwest end of Dead Horse Lake along the Dead Cow drainage area and junctions with the Dead Horse Rim Trail. This trail links up not only with the Lakes Loop Trail system but also to the Lee Thomas Meadow Trail. In June and July this trail is particularly known for its beautiful wildflower display. It is also known for its beautiful stands of Aspen. This trail is also well marked at junctions and with vertically aligned rectangular blazers. Dead Horse Rim Trail runs a distance of 9 miles and is ranked as easy to moderate with elevations ranging from 6,280 feet to 8,130 feet. The trail runs from Lee Thomas Meadow over Dead Horse Rim and ends at the North Fork of Augur Creek at Forest Road 34. It must be noted that there is a 1 mile section of southern trail that is interrupted due to a clear cut on private land. This trail connects to the Lakes Loop Trail and the Dead Cow Trail and offers a range of scenic views and environments. The Cache Cabin Trail is a historic, and yet fairly new trail. It originally served as a link to a fire detection station situated on Campbell Rim overlooking Campbell Lake. It was abandoned in the 1970's and was re-opened in 1995 as a result of public volunteers for a "Passport in Time" project. It connects the Dead Horse Rim Trail with the Lakes Loop Trail via the Augur Creek drainage. The Cache Cabin Trail, although short, is the most difficult of the Campbell and Dead Horse Trails. The elevation low is 6,050 feet and the high is 7,740, a 1,690 foot difference. The grades follow the fall line with a grade of 20 to 30 percent in places. In 1997 a freak windstorm came through the area destroying and flattening a 10 by 20 mile section of the Fremont National Forest. This trail runs along the border where the damage occurred. As a result, the trail has been interrupted in several places with piles up to 20 feet deep of fir trees. Budget limitations have prevented the Forest Service from cleaning up the storm damage and so potential users of this trail need to be aware of this trail's difficulty and frequent detours to navigate through the fallen trees, timber piles, and root wads. The Chewaucan Crossing Trailhead is an access point to the Fremont National Recreation Trail. It is paved access approximately 8 1/2 miles south west of Paisley. There are 5 campsites with tables and fire grates, and accessible outhouse, and parking for large groups and trailers. Nearby campgrounds include Marster's Spring, Upper Marster's, and Jones Crossing. Fishing access is available in the Chewaucan River for rainbow and brook trout. Birdwatching and wildflowers are also popular pastimes in this area. Although firewood may be gathered from the area around the campgrounds, drinking water is not available so make sure to bring plenty of your own. Gearhart Mountain Trail #100 runs a the length of the wilderness area covering 13 1/2 miles from the north to the south. It has a low elevation of 6,340 feet and a high of 8,120 feet and is ranked as an easy to moderate trail. The north access point is located at the North Fork Sprague Trailhead. This is a good place to start if the agenda is fishing rather than sightseeing. The trail leads to Blue Lake before traveling south. Campsites: None developed in Wilderness Area. Those desiring some interesting geological scenery should start from the Lookout Rock Trailhead, which is accessed a short distance from the Corral Creek Forest Camp. From the Lookout Rock Trailhead the Palisades are about 3/4 of a mile north. The Palisades is an area about 10 acres in size of convoluted rock formations, balancing rocks, and other interesting formations created by the process of time. This is a close enough destination for families with children. The Dome is a 300 foot high bare rock described as a "giant gumdrop" perched on the hillside. This formation is several miles farther north from the Palisades. The Notch is farther yet, which is a huge crack on the noth face of Gearhart Mountain. Boulder Springs Trail #101 is accessed only via the wilderness area from trail #100. It is a short 3 1/2 miles, but ranked as moderate to difficult due to steep grades and no maintenance. The trailhead previously located at Deming Creek was closed to protect the stream from siltation from the road. Deming Creek is a critical stream for bulltrout. No other access to this trail exists from outside the wilderness area. Government Harvey Trailhead provides access to the Fremont National Recreation Trail. Although the trail has not been constructed to the north, to the south it runs for 50 miles to Cox Pass. This portion of the Fremont National Recreation Trail runs along Winter Rim and provides stunning vistas of the Summer Lake Basin. Parking at the trailhead is limited. The trail is well marked and open to hikers, horseback riders, and mountain bike riders. There are plenty of activities for everyone in this area, fishing in the lower portions of Bear Creek, located about 5 miles from the trailhead, birdwatching, wildlife viewing, wildflowers, photography, and wading in Bear Creek are a few of the recreational opportunities besides hiking. The recommended season is from June to October. Hanan Trail #142 is open to hikers, equestrians, and mountain bike riders. It is a non-motorized trail. The trail is 8 miles long with two trailheads, the Hanan/Sycan Trailhead and the Hanan/Coffeepot Trailhead. It is listed as being an easy to moderate trail with a low elevation of 6,640 feet and a high of 7,460 feet above sea level. The steepest grade is 10 percent from the head of the Sycan River to the top of Bear Creek Rim. This runs for about 1/2 of a mile, otherwise, the grades are gentle. The trail runs between Coffeepot Springs and Boulder Springs on the Sycan River. The trail passes through many diverse environments from lodgepole pine to quaking aspen groves, from old growth stands of mixed conifers to flat rocky areas and meadows. Opportunities to view wildlife are excellent and fishing is available in the Sycan River at the northwestern portion of the trail. Wildflowers are plentiful during the late spring and early summer season in the meadows and river areas. season is June through October. The Hanan Trail is named for and was pioneered by John Hanan who was an early settler in the Summer Lake Valley. It is also suggested by archaeological evidence that segments of this trail played a part in the seasonal migration routes used by American Indians traveling between the Chewaucan Basin and the Sycan Marsh. 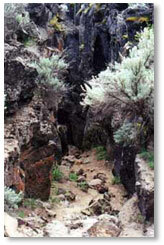 The trail also has some geological interest as it crosses the dividing point between the Great Basin and the Pacific drainage at the point of Bear Creek Rim. An interpretive marker is situated at this point in the trail. This point is also well situated for views of the Simmer lake basin, surrounding forests, and the eastern high desert. The Hanan/Coffeepot Trailhead grants access to the Hanan Trail via Coffeepot Springs. There is a parking area with adequate trailer turnaround area and rustic campsites. The trailhead has signed trail directions. It is maintained from June through October. The Hanan/Sycan Trailhead has a parking area with room for a trailer to turnaround. There are toilet facilities at the trailhead and rustic campsites. There are signed trail directions. It is also maintained from June through October. The Lee Thomas Trailhead gives access to the Lakes Trail System and the Dead Horse and Dead Cow Trails. The trail is open to hikers, mountain bike riders, and horseback riders. At the trailhead there is a parking are with suitable space for a trailer to turn around in. There are toilet facilities, horse corrals, feeders and watering facilities for pack animals. This area is maintained between June and October. This is a non-motorized trail system. The North Fork Sprague Trailhead accesses the Gearhart Mountain Wilderness from the north. There is a parking area with a turnaround area for trailers, signed trail directions, and an outhouse. The parking are and trails are maintained from June through October. The wilderness area is non-motorized. Cottonwood Creek Trail #127 is 5 miles in length ranging in altitude from 5,280 feet to 6,120 feet. The difficulty is classified as easy for hikers and bikers and moderate to difficult for horses. The trail travels along Cottonwood Creek form the Cottonwood Meadows Lake Recreation Area to Forest Road 3870.014. There is access to fishing along the distance of Cottonwood Creek. The grades are easy with a few narrow clearance passages that make the difficulty higher for horses. This trail makes for a nice day hike. They are closed to motorized vehicles. At the trailhead there is a parking area with adequate turnaround for trailers. There are signed trail directions. At five miles in length, Cougar Peak Trail #125 grants access to the top of Cougar Peak. Cougar Peak is one of the highest points in the region which provides spectacular views of Abert Rim, the Goose Lake Valley, and Gearhart Mountain. The trail travels through several areas of geological interest and various ecosystems from open country to stands of mixed evergreens. Wildflowers are abundant in the late spring and early summer. For horseback riders who wish to avoid the shale slides at the upper elevations, an old jeep trail provides a safer route at the upper elevations. The Cottonwood Loop Trail #128 is an easy two mile loop around the lake. It can also be combined with the Cougar Peak Trail for a total 12 mile trip. It is an easy trail for horses and families with young children as it is fairly level. There is parking areas with space to turn a trailer around. Toilet facilities are located in the campground. There are horse corrals, water troughs, an feeders for horses. The trails are marked.